The world is running out of critical resources. By 2050, demand for important resources like biomass and fossil energy is expected to surpass production by 40 billion tons, leaving companies and consumers at risk from the shortfall. Shifting from the traditional “take, make, consume, and throw away” economic model to a zero-waste, circular economy that focuses on making smarter decisions about resource use, using them to their maximum capacity, and reducing waste combats this global crisis. For electrical power distribution systems, the circular economy model means designing long-lasting products that can be retrofitted, refurbished, repaired, reused, and upgraded — minimizing waste and increasing resource resilience. Moving toward a global circular economy can have a major impact on fighting climate change because 67 percent of global greenhouse gas emissions are related to material management. In fact, a new report found that a circular economy could cut natural resource use worldwide by 28 percent and greenhouse gas emissions by 72 percent while still supporting economic growth and international environmental goals, such as those set in the Paris Agreement. These findings reinforce the idea that moving to a circular economy not only benefits the environment, but is also good for companies’ bottom line. For example, it’s predicted to allow European resource productivity to grow up to 3 percent annually. This creates a primary resource benefit reaching an estimated €0.6 trillion per year to Europe’s economies by 2030. 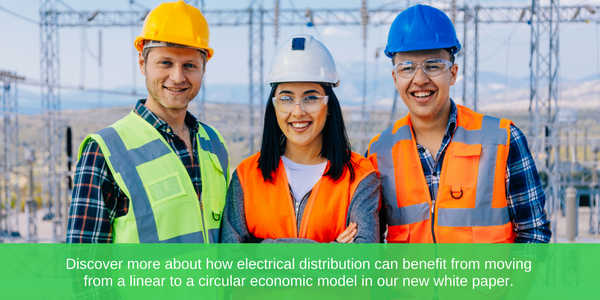 Electrical distribution equipment is well positioned to play its part in the circular economy by retrofitting equipment instead of replacing it. Retrofitting equipment improves sustainability and minimizes the environmental impact of products while also bringing significant cost savings and prolonging the equipment’s lifespan. An electrical distribution retrofit consists of replacing electrical distribution equipment components within medium voltage switchgear to renew and upgrade or add new functionalities, like digital connectivity. This both prolongs the equipment’s life and also allows important modernizations and upgrades without costly product replacements. Retrofit operations can cost up to 65 percent less than new installations. They not only reduce equipment costs, but also the cost of process downtime, materials, transportation, and site work. Analyzing the product’s complete environmental impact using life cycle assessment tools helps determine if it is more financially beneficial and environmentally efficient to retrofit or replace a piece of equipment. We’re committed to supporting the circular economy as a member of the Ellen MacArthur Foundation’s Circular Economy 100 program, an innovative program that brings together corporations, governments, academic institutions, small- and medium-sized businesses and others to foster industry’s collective advancement toward a circular economy. Learn more about how the foundation is enabling the development of new opportunities for a circular economy. I think this is the only long term solution for the environment, and in the end, for us. The consumer society is very attractive at first glance, but it is a voracious predator of the environment. As the population of the world grows, and the expectation of living is higher everyday, this has a multiplier effect on the demand for fresh resources. Not only resources are limited, but the amount of garbage generated is surely going to pollute air, land and water. Innovative services contributing to a circular business Ellen MacArthur’s Good Idea: The Circular Economy How circular economy thinking offers a more focused approach to recycling Retrofit versus Replace: What Should you do with our Power Distribution Equipment?